It's our birthday month and we are in the mood to celebrate! We have a fabulous brithday release in store for you this month. We are only five days away from the big day! All the new Stamps, Die-namics, and Stencils will be available on Tuesday, July 11 at 9:00 pm EDT. Be sure to check out the MFT Blog to see all the new items being revealed today. Don't forget to leave a comment on the MFT Blog countdown posts, YOU could win one of the five $75.00 gift vouchers. 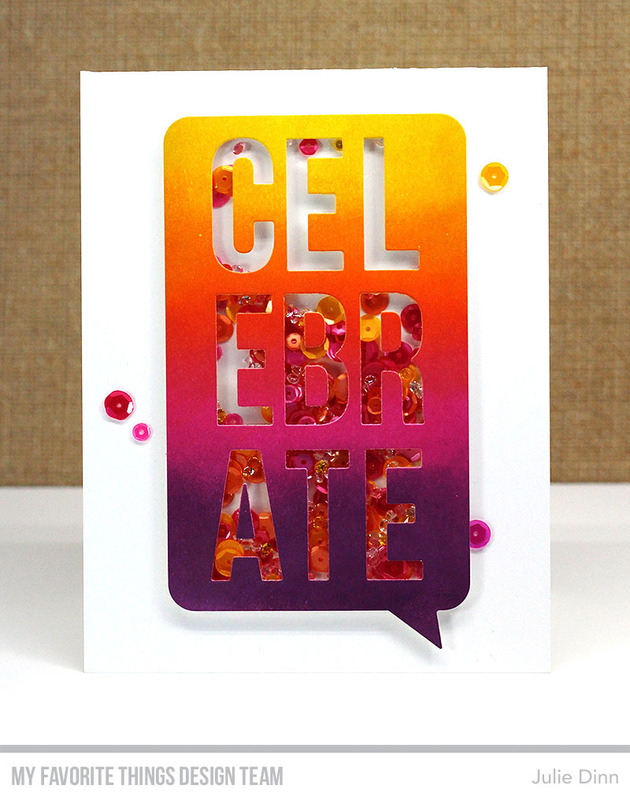 I have a couple of cards to share with you today that feature the fabulous Celebrate Speech Bubble Die-namics. For my first card I created a fun shaker card. This die is just perfect for creating shaker cards. 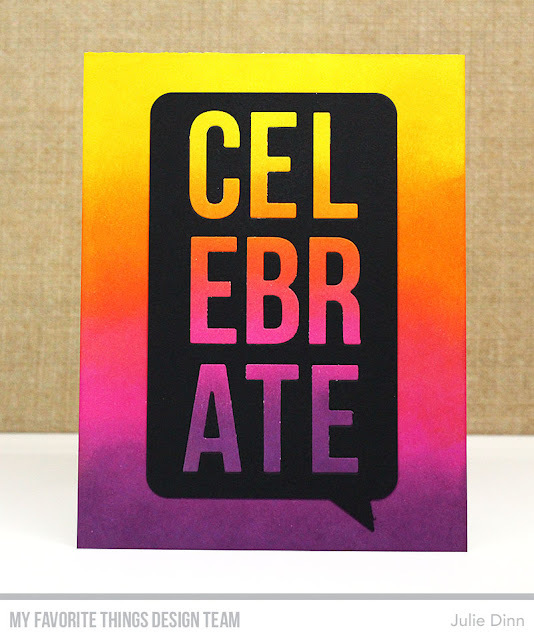 I used a few of my favourite colours of Distress Inks to colour a piece of Smooth White card stock, which I then die-cut with the Celebrate Speech Bubble Die-namics. I placed a piece of acetate behind the speech bubble, created a shaker with foam tape, and then filled the shaker with some Pretty Pink Posh sequins and a few Diamonds. After creating the first card I was left with these colourful letters, of course I couldn't let them go to waste. 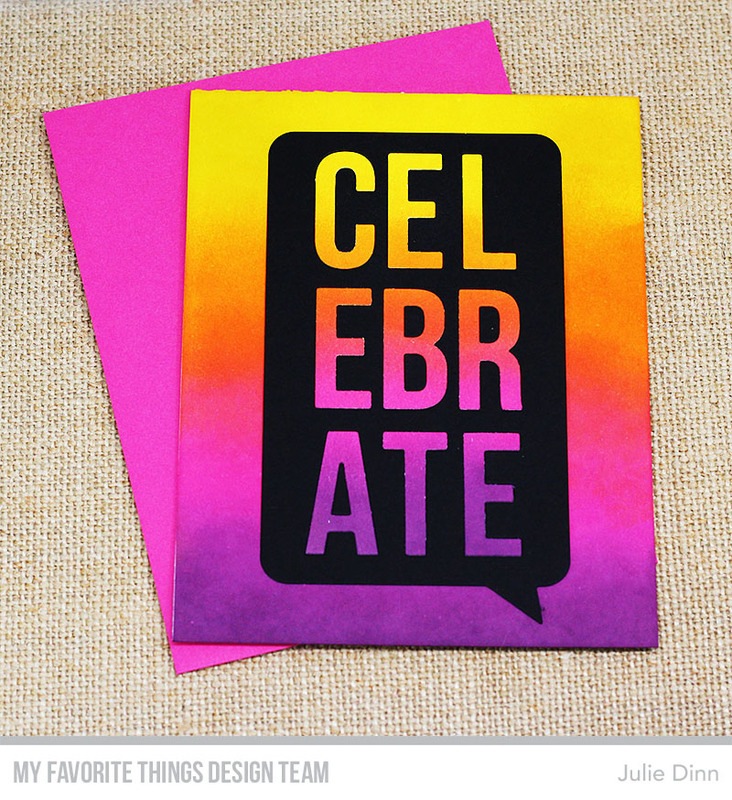 I die-cut the Celebrate Speech Bubble in Black Licorice card stock. I pieced in the inked letters. I used the same four Distress Inks on the background to mimic the colour blending on the letters. The card matches perfectly with a Razzle Berry envelope from the Assortment 2 Envelopes. Love the inlay technique!!! Great card! Lovely cards!Thank you for sharing! 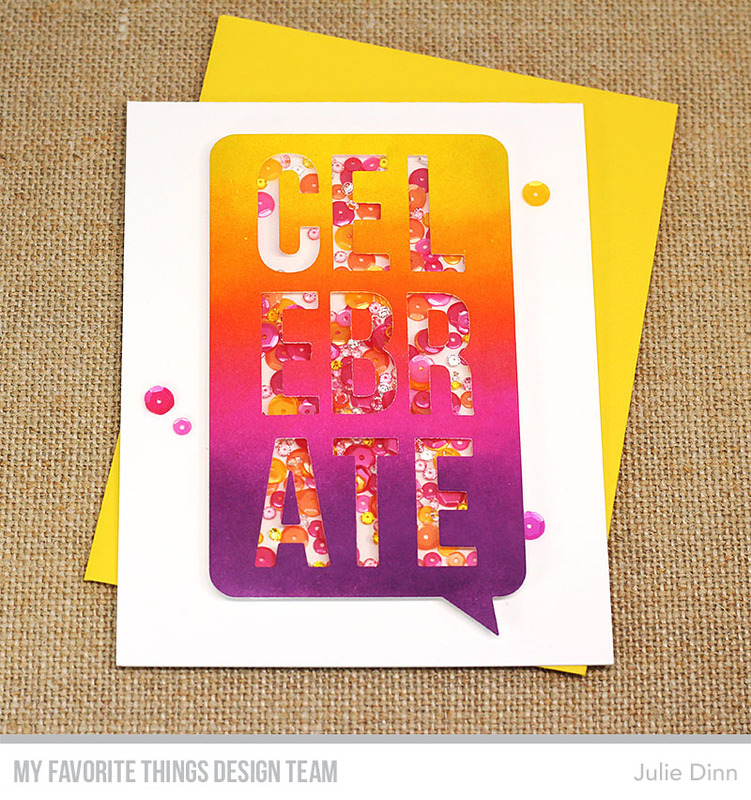 Inspired and economical way to create two terrific cards with amazing colors! Absolutely love your use of color!! Yours cards are so vibrant. I am glad you used this bubble tag. I have some ideas in my mind, you have given another one. I love it! OMG...These are some of My FAV colors. I wish I could lift these from the screen. You Rocked these cards. The blend is excellent. Great Release! CUTE cards! I especially love the shaker card!